The Castle Museum of the Budapest History Museum has its location in the former Royal Palace, which was built on the ruins of the medieval palace. 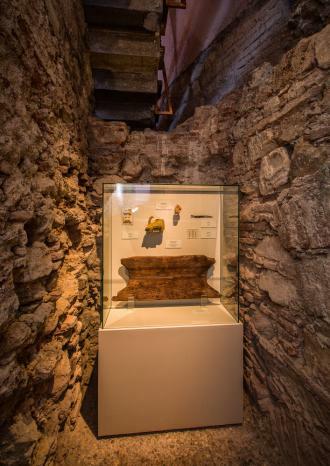 The remains of the medieval palace’s latrine are still there in the so-called King’s Cellar, which was recently refurbished and provided with a new entrance to the museum. Thanks to this renovation and the construction of the new Museo Mundial installation, visitors can now set foot in this room and get a brief overview of the history of the bathroom and the spread of flush toilets. This was a defining moment all around the world, since the spread of numerous diseases can be prevented by the proper separation of sewage and drinking water. The visitor walks through the entrance into the museum from the reconstructed medieval garden. The so-called King’s Cellar is one of the lowest areas in the museum. The huge space covered with a barrel vault served as the cellar in the Baroque palace. It was built in place of the eastern closed courtyard of the medieval palace. In the Royal Palace, there were several latrines at the disposal of the ruler and his retinue. This room was also located over a cesspit. From the toilet upstairs, a chute cut through the rock led to the pit, and the small room under the stairs was used for cleaning it. 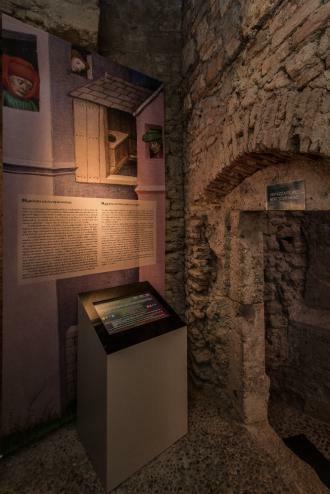 Visitors, after familiarizing themselves with the King’s Cellar, can reconstruct the history of the toilet on a touchscreen located in the room formerly used for cleaning the lavatory of the medieval palace. The brief overview on the touchscreen leads the visitor through the history of the bathroom and the spread of flush toilets up until the present day. The introduction and spread of flush toilets was a defining moment all around the world, since the spread of numerous diseases can be prevented by the proper separation of sewage and drinking water. The visitor can get an overview of hygiene in the Middle Ages and view, among other exhibits in the showcase, an original fragment from a medieval toilet seat designed for two people. We would have liked visitors to “bump into” at least one of the five installations on one of the floors of the museum (the museum has four floors in total). The new entrance to the museum from the so-called King’s Cellar leads tourists and visitors from the reconstructed medieval garden into the museum. By using the popular topic of a former lavatory (a topic still relevant today, since many visitors look for the toilet soon after entering the museum) we tried to arouse the interest of visitors from the start, in the case of those entering the museum from this direction. 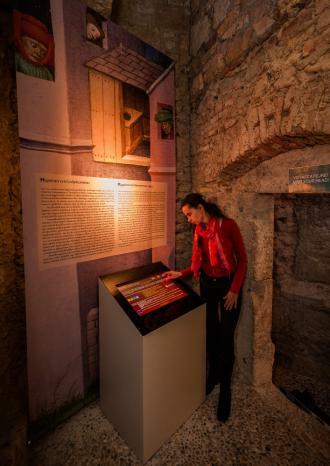 The reconstructed medieval lavatory provides an outstanding location for visitors to think about the habits of the people living in the former Royal Palace. The medieval part of the palace was reconstructed in the 1960s and, given that there had been no further significant refurbishment work carried out since then, we needed to ensure that all modern technical requirements for the use of a touchscreen within the installation were met. The estimate for equipment proved accurate, but programming needed to be better planned in order to produce a detailed estimate of the costs involved. To define the content, we consulted with the curators of the exhibitions, and the refurbishment of that part of the museum was a happy coincidence. We bore in mind the existing exhibition objects in this part of the museum and also consulted historians on the history of hygiene. The content had to fit the behaviour of the visitors as well. Since we planned to lead them through the history up until the present day, we needed to consider how long they would spend browsing on the touchscreen. The installation design matches the museum’s existing boxes and touchscreen systems. The installation was carried out in parallel to the refurbishment of that section of the museum. The theme of the history of the toilet complements the topic of the permanent exhibition. Visitors enjoy running through the history of the bathroom. The touchscreen system, like all IT systems, is sensitive to the behaviour of visitors. It is important to have permanent control over the equipment to ensure its proper functioning. It is necessary to implement an option for the visitor to go back on the touchscreen. Visitors like the short history explained through pictures and short texts; they would also appreciate the chance to browse for further information about this topic within the exhibition.